Microsoft has officially released the Windows 8.1 Update (previously known as Spring Update or Update 1) for MSDN and TechNet subscribers (if you still have active subscription and access to TechNet Subscriber Downloads which unfortunately no longer been offered) during the Build 2014 conference. The release includes both the Windows 8.1 Update package and pre-compiled slipstreamed Windows 8.1 with Update ISO images for various editions of Windows 8.1, Windows Server 2012 R2, and Windows Embedded 8.1 Industry. For Windows 8.1 users who don’t have access to MSDN nor TechNet, the Industry Update will be available from April 8th, 2014 as widely speculated, as part of the standard “patch Tuesday” updates. 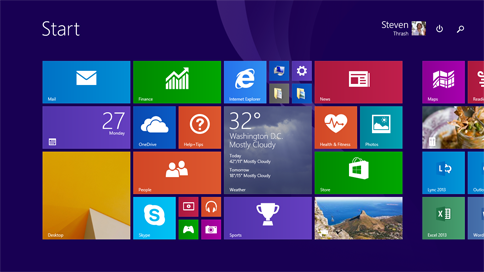 According to Microsoft, Windows 8.1 Update delivers a collection of refinements designed to give people a more familiar and convenient experience across touch, keyboard and mouse inputs, in addition to improvements for business customers, accelerating opportunity for developers, and enabling device makers to offer lower cost devices. Power and Search buttons at the upper-right corner next to your account picture on the Start screen. Select devices boot to desktop as the default setting. Pin both desktop apps and apps from the Windows Store as well as your favorite websites to taskbar. Access the taskbar from anywhere when moving mouse to the bottom of the screen. Minimize or close buttons for Windows Store apps when moving mouse to the top of the screen. Right-click on an app tile to get a context menu next to the app tile. 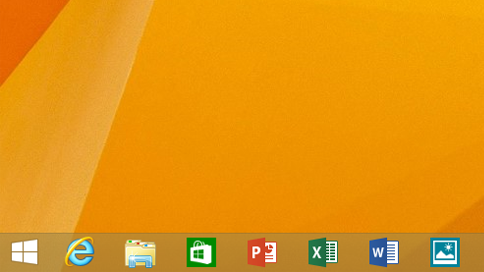 After installing the update, Windows Store is now pinned to the taskbar by default. After installing new apps, you’ll notice a message at the lower-left corner of the Start screen that points you to the Apps view so you can see what you recently just installed. Internet Explorer 11 adapts your browsing experience by detecting your Windows device and input type to adjust browsing experience, such as the number of tabs on-screen, the size of the fonts and menus. Control when the browser remains on-screen or hides away for full-screen browsing. Enterprise Mode Internet Explorer (EMIE) enables Internet Explorer 8 compatibility on Internet Explorer 11 so companies can run existing web-based apps seamlessly on Windows 8.1 devices. Extended Mobile Device Management (MDM) includes additional policy settings that can be managed with whatever MDM solution an enterprise chooses including whitelisting or blacklisting Windows Store apps and websites. New low cost devices with only 1GB RAM and 16GB of storage is now possible without sacrificing performance. Windows 8.1 Update packages and Windows 8.1 with Update ISO images are available from MSDN Subscriber Downloads and TechNet Subscriber Downloads. And as usual, the downloads have been leaked to the Internet. If you want to download any of the files, just search for the file name, and you would find plenty of magnet URIs, torrent links and direct download links. If you don’t want to download from unknown sources, and can’t wait a few more days, these updates have also been available directly from the Windows Update and Microsoft Download Center now. Here’s the direct download links from Windows Update or Microsoft Download Center, all of which is the same with previously leaked Windows 8.1 Update WU download links with the exception of new addition of KB2949621, a new hotfix included in Windows 8.1 Update Package released in MSDN/TechNet. Update: Windows 8.1 Update has been released officially.